Happy Thanksgiving! Now that the Turkey is about to be served it’s time to start thinking about Christmas, if you haven’t already. DISCLOSURE: This post may contain affiliate links. If you purchase items through my links I may earn a commission. You will not pay more when buying a product through my link and you do not have to use my links. I only recommend products & systems that I use and love myself, so I know you’ll be in good hands. You can find our full policy here. Thank you in advance for your support. I’ve mostly finished my Christmas shopping this year, but that’s because John and I aren’t exchanging gifts. Actually, we’ve decided we’re not exchanging gifts with my whole side of the family. My parents just retired, my youngest sister is a broke college kid, and we have two young kids. We decided to do away with the expensive gift exchanges and just get gifts for the young kids. On my wish list, for myself and for the kids, are some subscription boxes. I love the idea of subscription boxes! Whats better than ordering one time and receiving new and different things in the mail each month? I love that you don’t have to think about what’s coming and the surprise aspect of it. After lots of research, here are my favorite boxes. I haven’t tried all of them, but hopefully will get to soon. We did the free Graze trial and loved it, so we decided to keep our subscription! While we’re not wild about the fact that it’s only one serving size all; the things we’ve received so far have been delicious. Bugs loves the snack too. He’s always asking for more and it’s such a quick and healthy snack for him. Use coupon code AMYL7XMQB to receive your 1st and 5th boxes free! I love Amazon Prime. They seem to have everything. Including a book box. And it looks amazing. What kid doesn’t want new books every month? I love that you can tailor it to your child’s age and that the books are half of retail value. I did a couple StitchFix boxes over the summer and loved it. While the clothes are a little expensive for me, the style is great. I loved having someone else pick out my clothes for me since I’m horrible at it! I also love that I no longer have to go to the store and get to try on clothes from the comfort of my own home. I can’t wait to try this box. They’re also having a killer Black Friday deal right now, you can get up to 60% off! STEAM toys for all ages and boxes geared toward individual ages. They also have a great email list and send fun activities that you can do with your kids! 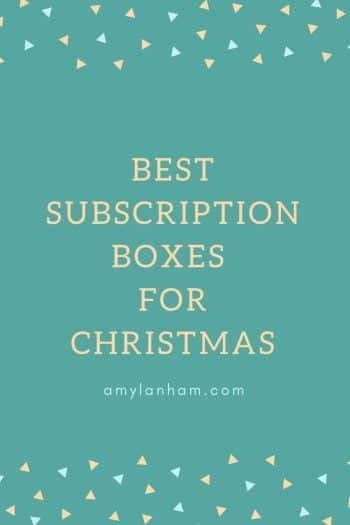 So far these are all the subscription boxes that I’m excited about for Christmas this year. Have you tried any good subscription boxes? I’d love to hear about them in the comments section!